Underpowered Hardware - I'm putting this under mixed because it didn't really matter, but the PS2 was clearly underpowered and missing features compared to its competition. This becomes very clear when you compare the PS2 port of Resident Evil 4 to the Gamecube original, or the PS2 ports of any of the Splinter Cell games to the Xbox originals. Still, the games worked and the PS2's impressive library basically made this a moot point, because the PS2's popularity made it the most successful console in history regardless. 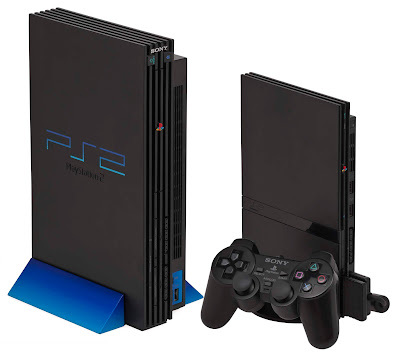 Legacy Hardware Issues - In many ways, the PS2 lives up to its name: it's a follow-up to the PS1, but the system itself doesn't make any major innovative leaps forward, a fact which really stands out when you look at its competition. For example, the Xbox was built around online gaming, whereas PS2 owners had to purchase a separate ethernet adapter which was expensive and under-utilized (although this did allow couch multiplayer to last for another generation at least). The Xbox also had a built-in HDD, making the necessary purchase of pitifully tiny, 8MB Memory Cards on the PS2 look embarrassing and archaic in comparison. A HDD was made available as an add-on, but it was once again an expensive, under-utilized peripheral which was only really used in Final Fantasy XI. The PS2 also had only two controller ports once again, making couch multiplayer games harder to manage. Glut of Shovelware - The PS2 era might have been the height of cheap, crappy licensed games, as they were very prevalent at the time, as this was an era where the install base was huge and games cost just enough to make that it was worth the investment to make a quick turn-around. In subsequent generations the mobile gaming scene would kill off this market trend (although it carried on over to the Wii as well), but when you go back to the PS2 you'll notice a plethora of awful games which were shovelled onto the system.